The maker of Chaparral and Robalo boats has been looking to buy a complementary business, specifically eying pontoon builders, although the company has been outbid by private equity groups so far. That’s according to Marine Products Corp. vice president of corporate finance Jim Landers, who told investors and analysts at a B. Riley & Co. conference in Santa Monica, Calif., that there is a “war chest” of cash set aside for such acquisitions. The company is operating at 50 or 60 percent of capacity, so it still has room to grow production from within, Landers said. “One thing about the boat business is that, managed well, it does generate cash,” he said. 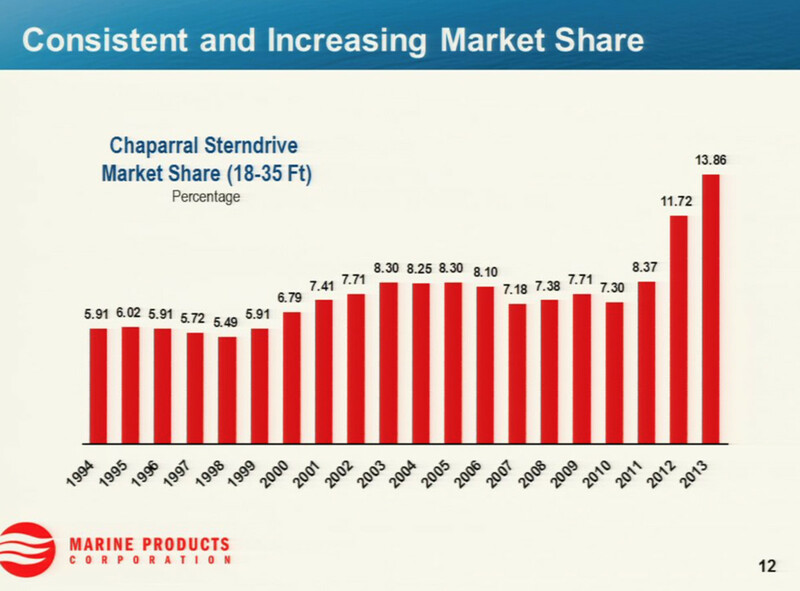 He also discussed the company’s growing market share in the tough sterndrive market that Chaparral operates within. The top five sterndrive builders control slightly more than half of the market, he pointed out, and Chaparral tops that list with 13.86 percent of the overall market. “In some ways boat manufacturing is like the auto industry 70 or 80 years ago,” Landers said, pointing out that several very small builders make up half of the sterndrive market share. Over time, that number shrank as companies merged and were acquired, he said. The value-priced Chaparral H20 has been a big part of the company’s growth, although that leveled off somewhat recently, Landers said. 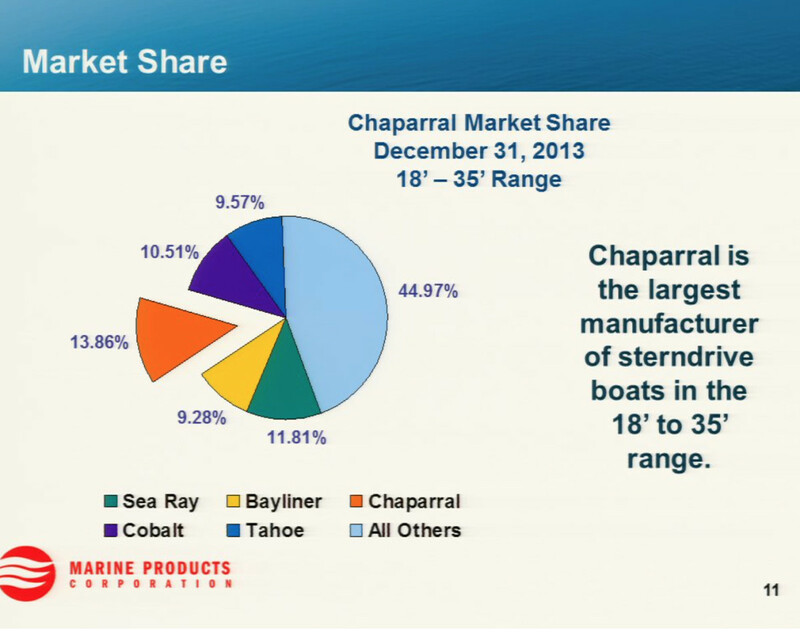 That has helped Chaparral gain a larger piece of the shrinking pie, Landers said, illustrating his point with a slide showing Sea Ray, Chaparral’s nearest competitor, with 11.81 percent of the market, followed by Cobalt with 10.51 percent. That gain has been steadily increasing since 2010, when Chaparral had about 7.3 percent of the overall market. That number leaped in 2012, to 11.72 percent, in large part because of the H2O, before leveling off somewhat in 2013 at 13.86 percent.